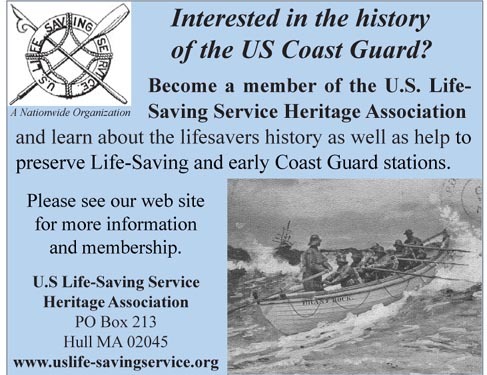 U.S. Life-Saving Service and U.S. Coast Guard Rescue Craft History. Fine web site by Tim Dring, Commander, U.S. 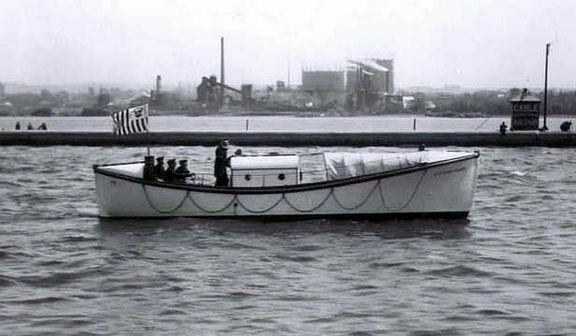 Naval Reserve-Retired, dedicated to the U.S. Coast Guard, its predecessor U.S. Life-Saving Service, and their use of specially-designed small craft for rescue purposes. Filled with photos, drawings and information about the many classes of Coast Guard rescue craft over the years. Visit the all new American Lighthouse Foundation web site. Formed in 1994, the foundation has been responsible for restoring a number of lighthouses and helping with numerous others. One such light is Race Point Lighthouse in Provincetown on Cape Cod. Visit their Race Point Lighthouse site to book a wonderful vacation at the lighthouse. Spend a night, a weekend, or a week as a lighthouse keeper’s guest as it would have been in the early 50’s. You’ll be the guest of the New England Lighthouse foundation at beautiful Race Point Light at the tip of Cape Cod in Provincetown, Massachusetts – within the Cape Cod National Seashore. 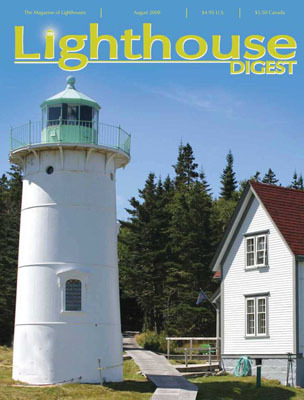 Also, be sure to subscribe to the Lighthouse Digest Magazine. This is surely one of the most interesting magazines on the subject available. 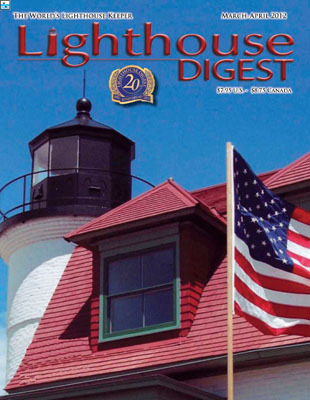 Published every other month, contains wonderful historical articles on lighthouse life, restoration projects, lighthouse happenings and more. Paintings by Clifton Hunt of Rutland, Massachusetts. 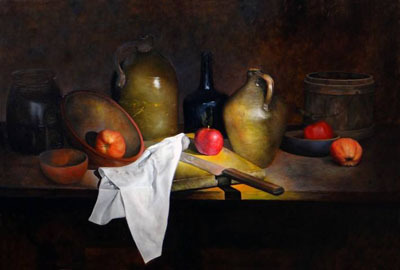 Wonderful still-life paintings available from Clifton Hunt or Rutland, Massachusetts. Cliff and Debi own Holiday Acres Equestrian Center, teaching young and old alike to love and excel in the world that is horses and Cliff paints in his "spare time". 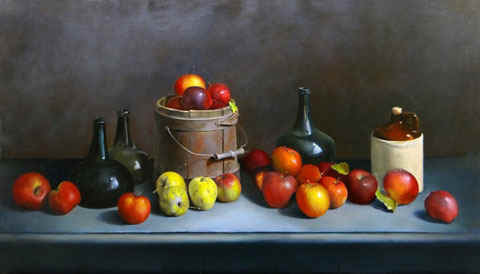 His work is superb and an original by Cliff would grace any room of your home. Pick from is many works available or commission a piece for yourself. 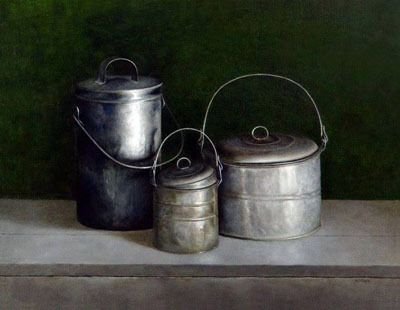 His paintings are on display at local museums and other venues. See more of his work on his Facebook page Clifton Hunt. See the Web Site of Marshall DuBock. Marshall DuBock has always been fascinated by the inimitable history, personality, and grace of Nantucket Island . DuBock continued his art education at the Portland School of Fine and Applied Art and in Florence , Italy , and throughout the years has carefully developed a realistic watercolor style that distinguishes him as one of Nantucket Island 's most beloved artists. 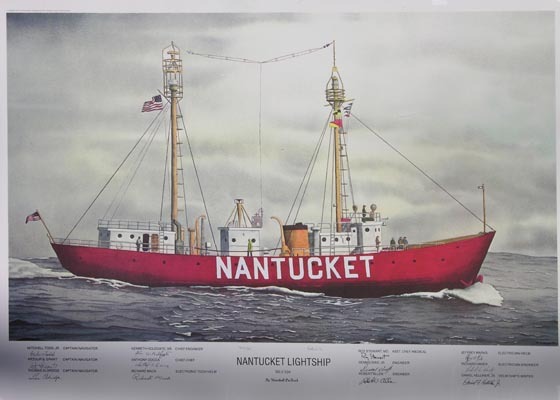 In 1979 he opened The Nantucket Gallery at 23 Federal Street , which offers original watercolors and signed, limited-edition prints. A year-round resident, the artist continues to combine current visual impressions with years of memories abetted by his extensive knowledge of Island history, and as a result he captures the very spirit of the Island in his watercolor paintings, which are known, collected, and loved all over the country. Take a look at Naval-History.net. Under the leadership of the University of Oxford's Zooniverse programme, the UK Meteorological Office, the US National Oceanic and Atmospheric Administration, and Naval-History.Net are working together to transcribe weather data and naval events from the logbooks of United States ships in the 19th and 20th centuries. 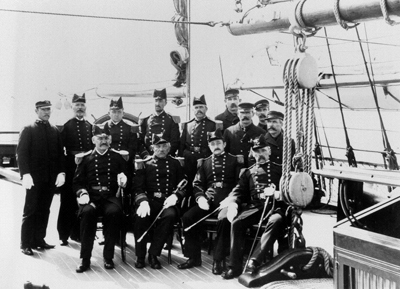 This first phase involves 14 ships of the US Revenue Cutter Service, later US Coast Guard, during the years ranging between 1863 to 1945. Another includes ships of the US Navy. Brief details and photos can be found at the beginning of this page, with links to more detailed information further on. Good information and photos. U. S. Coast Guard 44 Foot Motor Life Boat Restoration Project CG-44301. 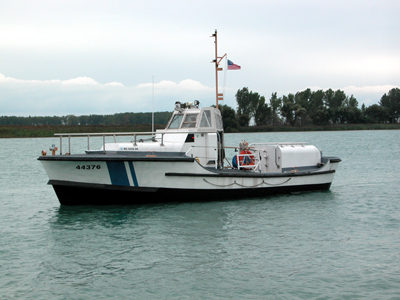 The US Coast Guard 44 Foot Motor Life Boat was the workhorse of the rescue boat fleet. Originally designed in 1961, the steel-hulled 44-foot motor life boats were built at the U.S. Coast Guard Yard in Curtis Bay, MD., between 1963 and 1972. This web site is dedicated to the restoration and continued operation of motor life boat 44376, owned and operated by Jeff Shook in Michigan. You will learn about this boats history and the entire restoration process as well as other 44 foot motor life boat links and resources for restoration. A great site and a great restoration by Jeff. 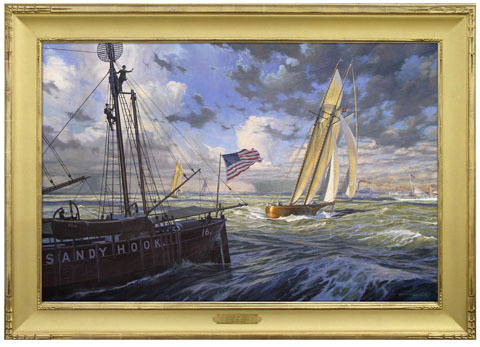 Today, Russ Kramer is widely regarded to be among the country's leading marine artists. His large-scale studio paintings create 'first-hand' experiences for the viewer, putting you right on board during some of history's greatest yacht races or turn-of-the-century luxury vessels. Take a look at his many original paintings and limited edition maritime prints on his web site The Marine Paintings of Russ Kramer. 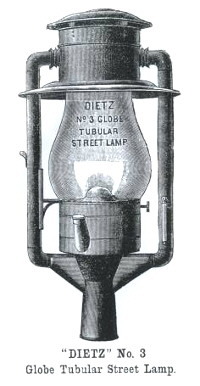 W. T. Kirkman Oil and Electric Lanterns, the Most Complete Source for Dietz Hurricane Kerosene Lanterns, Oil Lamps and Tubular Lantern Parts in the World! Be sure to visit the Museum of New Jersey Maritime History, Beach Haven, NJ. Exhibits include: Rare and Out-of-Print Research Library, Lending Library of New Jersey-Related Books, TV/DVD/VHS Units in 5 of the Museum's Exhibit Halls, Black Whale Gift Shop, Home of Alliance for a Living Ocean, Guest Presentations on New Jersey Shipwrecks & Coastal History, Hundreds of Maritime Photographs and Documents, Computerized Database of over 6,400 New Jersey Shipwrecks and Maritime Disasters, Exhibit of artifacts recovered from New Jersey wreck sites. Peter Cosby Antiques. Based in Petworth, England we offer fine oak antique country furniture, country dining tables, antique clocks and may other antiques including antique settles, chairs and cupboards. We highly recommend: At Last! Studio – Bookbinding. Founded in May 1993 by Ruth Strach, the At Last! Studio is a small, fully equipped hand-bindery offering the following services: Leather and cloth bindings and restorations; Custom books, including albums, guest books, journals, theses, dissertations, etc. ; Custom boxes, including slipcases and clamshell designs, as well as boxes for photographs and mementos; General book repairs for bibles, cookbooks, albums, children’s books, and all other books which may or may not be valuable but are certainly important to the person who would love to read them again and / or share them with others. To discuss your bookbinding needs, please call or write the At Last! Studio, Ms. Ruth M. Strach, 184 West Greenville Road, North Scituate, RI. 02857. (401) 934-2171. Gull Rock Light-keepers (GRL) is a Michigan-based nonprofit whose sole mission is to preserve and restore the Gull Rock Lighthouse. GRL was formed by Peter Annin, a former Newsweek correspondent who is currently writing a book about the Great Lakes for Island Press. During the summer of 2004, Gull Rock Lightkeepers teamed up with the nonprofit Michigan Lighthouse Conservancy (MLC) and recently assumed ownership of Gull Rock Lighthouse. Fort Warren, located on George's Island in Boston Harbor, is a former Civil War prison and continued to be a harbor defense fort for many generations. Started in 1833, Fort Warren belonged to the federal government until 1958, when the state obtained possession. Today the fort is maintained by the Department of Conservation and Recreation (DCR) and is the centerpiece of the Boston Harbor Islands, a national park area. The fort is situated on a 28-acre island at the entrance to Boston Harbor where it once protected the main shipping channels. Visit author Jay Schmidt's Fort Warren site for more information including books on the subject. For a superb site featuring references on antiques and artifacts of the US Lighthouse and Life-Saving Service, visit the Michigan Lighthouse Conservancy. The Great American Lighthouse Resource!! - dedicated to delivering a content-rich presentation of each of these great American nautical guides including: Present Day Facts Regarding Accessibility, GPS Coordinates, Directions, Maps, etc., Historical Information. Local Bed & Breakfast Inns and Boat Tours, and more. We recently found this web site http://uniformslist.com They have thousands of links for uniform information of all descriptions. Includes a great deal on Coast Guard Uniforms, Navy, Army, fire department and hundreds more. . The Swedish Lighthouse Association is a great group with an excellent internet site if you are interested in not only Swedish lighthouses and lightships, but they also have an excellent set of pages on AGA navigation devices including lamps, lamp changers, lenses, buoy lights, etc. Do you love lighthouses? The Lighthouse Store has the most comprehensive selection of lighthouse collectibles on the Internet. Now everyone with a passion for lighthouses can decorate their home with lighthouse-theme merchandise. You'll love to browse our pages for the right lighthouse collectible, to be a gift for someone else or, better yet, for yourself. Do you have pictures that are damaged and in need of repair? Do you have pictures that you would like presented better? Would you like pictures that you cannot take with a camera? If so, we would like to help. 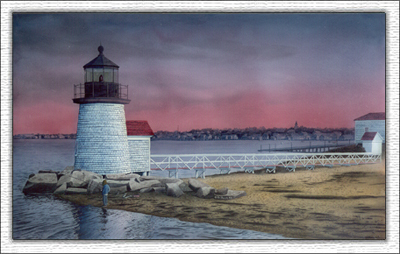 Click on the Lighthouse Photo Repair site for information on repair of antique photographs, enhancement and much more. 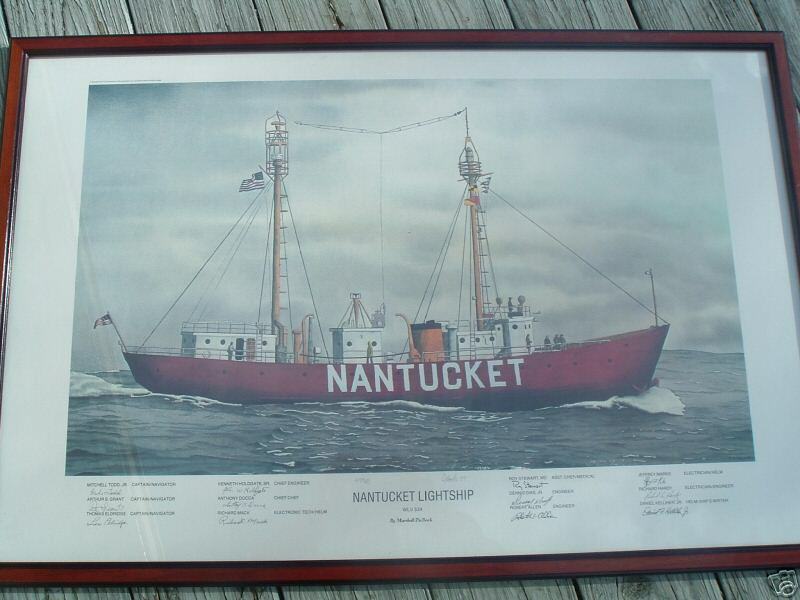 Click on the Lightship Sailors web site for lightship history, heroes of the past, reunion information and much more. Another great reference site is Terry Pepper's Seeing the Light. For information on medals, tokens, ribbons, political, Masonic and more, go to www.exonumia.com. See Argonaut Traders for navigational instruments, antique diving equipment and more. Visit the Lighthouse Shop for a great selection of interesting lighthouse gifts and other items. We are in this for one reason and one reason only - to restore the Rockland Breakwater Lighthouse. As the Friends of the Rockland Breakwater Lighthouse, our mission statement reads: "To direct and support the restoration, preservation and long term maintenance of the Rockland Breakwater Lighthouse and to provide public access to the structure for education and enjoyment." A wonderful site for the history and latest developments in the restoration effort. New England Lighthouses - A Virtual Guide is a wealth of wonderful information, books, posters, photos and much more covering the lighthouses of New England. Welcome to Bluejacket.com. Enjoy the graphics and enrich your knowledge base with the facts and figures that have been gleaned from numerous sources to celebrate the tradition and heritage of the United States sea services. Your web master is Gene Oleson, a former enlisted member and officer in the United States Coast Guard, and a retiree from the United States Navy. Filled with history of vessels, uniforms, reunion information, books available, and more. Discover breathtaking pictures that allows you to create a unique home that will refresh and uplift your soul. Also makes a wonderful gift idea. Enjoy free screensavers, free wallpaper at Lighthouse Picture Gallery & Nature Photos. For a wonderful tour and information about coastal Maine, lighthouses, fishing and more, visit Carol Standish at Maine Harbors. Wisma Antik www.wisma.com.au Dealing in antique advertising, shipwreck artifacts and vintage nautical items, vintage toys, porcelain, whisky related, and much more. For a fine general line of stereo views, CDV's and photographs of all descriptions, visit David Spahr. Dave also includes numerous resources and links to help you in your search. Also visit Dave's stereoview web site. Shore Village Museum , now the Maine Lighthouse Museum, is a wonderful museum of out Lighthouse Service, Life-Saving Service and Coast Guard history. Be sure to check out their page, and say "Hi" to Ken Black when you stop by. Ken is the founder of the museum and one of the kindest and most knowledgeable supporters of lighthouse history and preservation. Constructed in 1844 the Gibbs Hill Lighthouse is the oldest cast iron lighthouse in the world. The hill on which the lighthouse stands is 245 feet high while the lighthouse itself measures 117 feet. A 1,000 watt bulb sits inside a lens revolving in a trough of 1,200 pounds of mercury. Bermuda 4U is a comprehensive and independent guide to the island of Bermuda. Find information about the lighthouses, your ideal hotel, cruise, restaurant, golf course, wedding venue, job, and much, much more. Plan your vacation now. Check out Brass and Bounty for a complete line of nautical antiques, antique lighting, lanterns and more. http://www.freecycle.org/ Welcome! The Freecycle Network™ is made up of 4,926 groups with 8,193,125 members around the world. It's a grassroots and entirely nonprofit movement of people who are giving (and getting) stuff for free in their own towns. It's all about reuse and keeping good stuff out of landfills. Each local group is moderated by local volunteers (them's good people). Membership is free. To sign up, find your community by entering it into the search box above or by clicking on 'Browse Groups' above the search box. This page updated October 02, 2016 . All text and illustrations on web site Ó James W. Claflin . 10/02/2016 All rights reserved. Use prohibited without written permission.